Sarah Elisabeth Sawyer (Choctaw Nation of Oklahoma). Image courtesy of artist. In the 2015 Artists in Business Leadership Program (ABL), I (Sarah Elisabeth Sawyer, Choctaw Nation of Oklahoma) was strengthened as a literary artist. I embraced my work without fear. I published three books with support of the fellowship. I could sell those books with confidence and with heart, knowing the work I did went beyond myself. It reached into my community, into the lives of storytellers, preservationists, and tribal leadership. The books have become a force of change now rippling out nationally, and even internationally. My fellowship embraced the values of ABL — independence, generosity, satisfaction and credibility. Two are heart-based; two are business. The cumulative results changed my career. Through First Peoples Fund’s fellowships since 2004, hundreds of individual artists and their families have experienced this change in their art creations and their businesses. They’ve seen their worth as artists, moving from shoe-box accounting to QuickBooks through the business coaching with Native community development institutions and First Peoples Fund’s Native Artists Professional Development trainings. Native artists who feel seen and valued as whole persons are ultimately more successful and realize their importance of sustaining cultural practices at the community level. Now First Peoples Fund is tightening the weave in our work. Beginning with assessment and engagement processes with nearly 200 partners, advisors, trainers, artists, staff and the board of directors, First Peoples Fund moved through a deepened understanding of the Collective Spirit®. Together we witnessed it first-hand from the field and analyzed how change happens, starting with the individual artists who are the foundation of all First Peoples Fund does. A deep value is placed on the power of artists and culture bearers. This moves to the community level of working with Native community development financial institutions and other nonprofits who support artists, a transformation that flows both ways — into the artists and into the communities. First Peoples Fund helps these organizations leverage their resources, and then artists increase their revenues by providing direct services to their communities. Strong communities of artists create momentum nationally to strengthen Indigenous arts ecologies that once thrived within tradition-based economies. Culture bearers (Community Spirit Award honorees) focus on restoration. They are often deeply committed to bringing back so much that was taken or literally extracted from their communities — ceremonial items, languages, dances — and restoring them. Restoration is at the heart and center of First Peoples Fund. Tribal leader, president of the Northwest Native American Basketweavers Association, and full-time artist Bud Lane III (Siletz) recognized the power of the Strategic Plan and its focus on Indigenous arts ecologies. When he first read it, he said “Here I am,” and offered himself as an artist, a community member, part of a nonprofit organization. Bud Lane III (Siletz). Image by David Bernie. 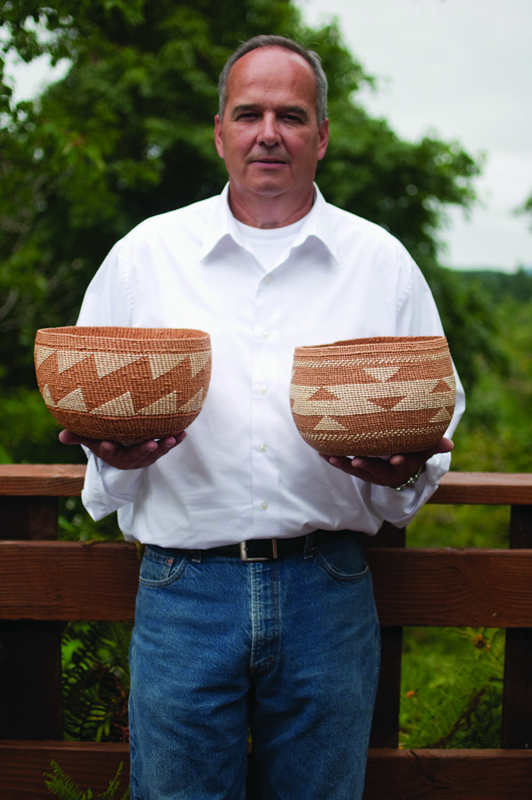 Bud is a member of First Peoples Fund’s board of directors and a Community Spirit Award honoree who alongside tribal members dedicated himself to restoring Siltez tribal songs, dances, regalia, and repatriating baskets and other cultural items. As a young man, he mentored alongside leaders who fought hard to regain federal recognition and land recovery in the early 1970s. As vice chair of the Siletz Nation and chair of the basketweavers association, he saw first-hand the value of cultural recovery in rebuilding of his family, community and his tribal Nation. He learned the importance of balancing the “head and the heart,” rebuilding a traditional dance house while also providing business support to emerging artists through the weavers association. Wesley May (Redlake Band of Chippewa) is a culture bearer in his community whose experience exemplifies First Peoples Fund’s philosophy or Theory of Change. While receiving a loan for his Tribe, Wesley saw how important it was to engage his community through healing for the youth and by providing business support to families of beadworkers. An artist for over 20 years, he transcended through mediums until he became content with acrylic paint. Trials, tribulations, and experiences led him to where he is today — honestly sharing his story through art. Wesley May (Redlake Band of Chippewa). Image courtesy of artist. He is the founder and owner of Wesley May Arts, a clothing line based on his artwork. He believes an artist’s role in the community is to bring awareness of voices rarely heard — not to lead the charge of any cause but to unleash the potential of others through art. With his Cultural Capital and Artists in Business Leadership fellowships, First Peoples Fund helped him not only identify his values and goals but put them into action. Wesley knows that by strengthening culture in the community, the business will happen. With support from First Peoples Fund, along with help from his tribe, he’s producing art through his space with his community and the youth. Lani Hotch’s (Tlingit) community has experienced the transformation First Peoples Fund can bring. In 2016 — through funding from the Surdna Foundation, assistance from First Peoples Fund, the National Endowment for the Arts, and the Institute of Museum and Library Services — the Jilkaat Kwaan Heritage Center opened the Chilkat Cultural Landscape Map exhibit for Lani’s community and visitors. She’s brought healing to her community through art. Jilkaat Kwaan Heritage Center Grand Opening Video by PlainDEPTH Consulting, May 2016. Former Community Spirit Awards and Cultural Capital recipients help First Peoples Fund be clear about our path and vision, and stay on a trajectory grounded in the heart. Change takes time and requires strong relationships. Going forward with a sharp strategic focus, First Peoples Fund will build stronger systems to move individuals and partners through their values-based Theory of Change, create transformative processes within, foster strategic opportunities to connect, and invest in change-makers to move the field collectively. This begins with the six needs of artists: access to capital, networks, business knowledge, markets, creative space and supplies. With these needs in mind, First Peoples Fund thinks in terms of the greater Indigenous arts ecology and all aspects of support required for the work. When culture bearers and community support organizations work closely, they drive significant movement in the ecosystem, creating on-the-ground training to better leverage First Peoples Fund’s existing resources and programs (Rolling Rez Arts, Dances with Words™, and the Native Artists Professional Development trainings). When culture bearers are in the center of the ecosystems, their presence touches the Indigenous arts ecology to weave a national network. Their wisdom and traditional practices are woven into the ecology. Current partnerships with Alternate ROOTs, the National Association of Latino Arts and Culture, the PA’I Foundation and the subsequent creation of the Intercultural Leadership Institute show how Collective Spirit contributes on the national level. Individuals, communities, national leadership. These overlapping and intersecting components of the Theory of Change make it a vibrant, breathing organism. They feed one another, weaving systems and tracking points of intersection to make the ecosystem stronger. Impactful. 2017 is a year of “investing in our own,” a year of expanding organizational and program development to strengthen our abilities and uplift the Collective Spirit®. To grow national Indigenous arts ecologies, one artist and one community at a time.